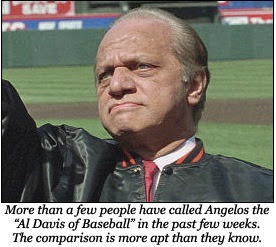 There was a time, and it wasn't too long ago, that Peter Angelos was a great man. In many ways—ways perhaps more important than baseball—he still is. He was born on the last Independence Day of the Roaring Twenties and grew up during the Depression. The son of Greek immigrants and a few years too young for the Second World War, he made his way through college and then the University of Baltimore Law School. He began his career as a trial lawyer in criminal defense, where he remained for a time; in 1961, he founded the Law Offices of Peter G. Angelos. Immediately his eye turned to Baltimore's labor unions; from the early 1960s through the 1980s, his firm represented Baltimore's steelworkers and longshoremen against company owners and the city itself. Then, in the 1980s, like just about every savvy activist attorney with an established private practice, he embraced the class action lawsuit. Never forget that the reason Peter Angelos owns a baseball team in 2011 is because he helped make asbestos a household word in Maryland in the 1990s, when a series of suits on behalf of Baltimore workers were consolidated. When a Circuit Court jury ruled that manufacturers knew their product was a slow killer and had sold it to the city's manufacturing base anyway, Angelos not only became a rich man but a hero. He was the man whose firm represented unions and tradesmen, whose landmark litigation punished one of the most negligent and in many cases actively malevolent industries in the country. Angelos didn't stop at asbestos: his firm later pursued class actions against tobacco companies, as well as pharmaceutical giants that knew their diet pills were dangerous. He was and remains a generous philanthropist, a staunch, lifelong contributor to the Democratic Party—both tremendous positives in the city of Baltimore—and by the mid-1990s, he was the owner of the Baltimore Orioles. There's no need to unduly canonize Angelos; after all, these cases did make him wealthy. But in a country where many of the men and occasional women who own professional sports teams do so either from inheritances or their more-than-occasionally dubious careers in the world of finance, a man whose wealth has a legitimate background in social justice is something to be recognized and applauded. And when Angelos bought the team, he seemed precisely the sort of owner with the money and the interest to keep them relevant for years to come. He seemed perfect. For a time, he was. Angelos' ownership group, himself the controlling partner, bought the Orioles from Eli Jacobs in 1993. That year, the Orioles were 17th in the league in payroll—a shade under $30 million. In 1994, 10th ($38.7 million). In 1995 they were second overall at $48.7 million, $10 million behind the New York Yankees. They would remain in second behind New York until 1998, when they outspent the New York Yankees and the rest of Major League Baseball. Their payroll? $74,170,921. Their record? 79-83. They have not had a winning season since. On October 28, it comes out that Jerry Dipoto is in very, very serious talks with the Los Angeles Angels of Anaheim. No one can blame an assistant general manager with his eye on the prize for taking that job over the one in Baltimore; the Angels have an ownership willing to spend, a weak division in which to contend and a few guys in the rotation who would have had Cy Young arguments this year if not for Justin Verlander. Soon after, Dipoto informs the Orioles he is no longer interested in their position, becoming the California club's next top executive. This only improves Tony LaCava's chances. He's now the odds-on favorite. The Sun's Dan Connolly writes that he's not sure Dipoto was ever ahead of him; he thinks it's possible they liked LaCava more from the get-go. The Blue Jays executive returns to Baltimore on Halloween for a second interview, this one involving an extensive sit-down with Angelos. The national media agrees: if Baltimore has its way, they'll be announcing LaCava as their new Executive Vice President of Baseball Operations in days. They likely won't even do a second round of interviews. By the end of the day, well past sundown, the only news out of the warehouse is that there is no news. Sources in the organization are no longer willing to rule out another round of interviews. Mid-afternoon on November 1 it breaks that LaCava was offered a competitive contract by the Orioles to run the franchise's baseball operations, and he turned them down. Half the rumor mill wants to know why; the other half has already started going crazy with possible new candidates. LaCava's official statement on the matter is extremely gracious, not only to the Orioles but even more so to the Blue Jays. It is the ultimate "it's not you, it's me" bit, and of course Danny Knobler of CBS Sports is there to inform Baltimore that, sorry guys, it's actually you. His report cites sources with knowledge of the situation claiming that LaCava walked away because Angelos was unwilling to give him complete hiring and firing control over the front office; specifically, the Baltimore owner was unwilling to let LaCava clean house on staffers who had been in place over at least the previous few regimes and start fresh with his own guys. Knobler's report surprises no one. The names (and roughly corresponding organizational positions) that get attached to the Orioles' hunt in the next few panic-filled days include but are not limited to: Ned Colleti (General Manager, Dodgers); Andrew Friedman (General Manager, Rays); Rick Hahn (Assistant General Manager, White Sox), Mike Radcliff (Assistant General Manager, Twins), A.J. Preller (Senior Director of Player Personnel, Rangers), Thad Levine again (Assistant General Manager, Rangers), Scott Proefrock (Assistant General Manager, Phillies), Mike Arbuckle (Assistant General Manager, Royals), Dave Littlefield (Former General Manager, Pirates), and Omar Minaya (Former General Manager, Mets). One name stands out: Dan Duquette, cousin of ex-Orioles co-General Manager Jim Duquette, former General Manager of the Montreal Expos and the Boston Red Sox. At the time, he is not a General Manager, an Assistant General Manager, a Director of Player Development or even a scout. At the time, he runs a sports academy for children in Hinsdale, Massachusetts. He has not held a job in Major League Baseball since the Red Sox fired him in 2002. His most recent involvement in the specific challenges of the American League East was appearing in a community theater production of Damn Yankees a few years prior. While all the other names circle about the head of the franchise—dreams and nightmares both—one thing is clear from the moment LaCava turns Angelos down: Baltimore will have Dan Duquette in for an interview. He is at the top of their list. 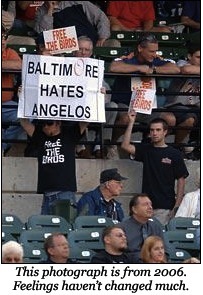 Occasionally, Baltimore fans claim that Peter Angelos doesn't want to win. That he wants the team to fail. That he watches the on-field product die smiling and enjoys profiting from its corpse, bloated as it is with home games against the Yankees and the Red Sox. They’re wrong, of course; unfortunately for the Orioles, nothing could be further from the truth. The league certainly has ownerships that are at best unwilling or unable to provide the payroll that funds year-in, year-out top echelon contention and at worst use the team as a disgustingly cynical money-making operation or personal piggybank. Oakland Athletics owner Lew Wolff and the group in San Diego headed by Jeff Moorad are good examples of the former; Royals owner David Glass, Mets owner Fred Wilpon and soon-to-be-ex Dodgers owner Frank McCourt progressively worse examples of the latter. Jeffrey Loria, former owner of the Montreal Expos and currently of the Florida Miami Marlins, doesn't fit easily into either group. More than any other owner in professional sports, his motives are an enigma. His Marlins have won the World Series twice; both times, within a matter of months, the team either traded every expensive player on those rosters or let them walk. He just signed ace Josh Johnson to a long term contract, but only after the MLB Players Association opened an investigation into the Marlins' befuddlingly low payroll. He seems to have perfected the art of pocketing vast amounts of revenue sharing and then, just when fans think he's the lowest of low, turning around and giving them a season to remember, before blowing it all up and starting the cash cow over. Despite the worst economy in 80 years and the fact that baseball stadiums do not make the public money, the city of Miami naturally gave him a fantastic deal on a new stadium. Now that he's gotten the stadium he craves, will he turn around and spend the money to take the Marlins to the next level? And if not, why are the Marlins giving the full-press wine-and-dine treatment to Jose Reyes, Albert Pujols and just about every other big-name free agent on the market? Angelos, on the other hand, is much easier to read. His management style closest resembles that of the late George Steinbrenner—not just of the Bad Old Days of the early 1990s but the years before that, the mid-to-late 1980s, when the team declined every year as Steinbrenner traded away the future and went through roughly a General Manager per season due to dictatorial meddling. It is, on many levels, an insult to equate the two men. Steinbrenner was a whiner, a bully and a moron who violated campaign financing laws, pled guilty to felony obstruction of justice and got himself banned from day-to-day operations of his own team for paying off a gambler to dig up dirt on a player who had hurt his feelings. In his prime, he comported himself in public with all the gravitas of a teenager who crashed daddy's sports car three times and can't understand why the fourth car he got is a sedan. Before it became an integral part of the Yankee brand, Steinbrenner's "grooming standard" was merely a rich child's power trip. Angelos made his money as an extremely well-compensated social crusader; Steinbrenner made his when his father died. It says a lot about the differences between the New York and Baltimore franchises, then, that what was an irksome defect in the Yankees' iconic owner is Angelos' tragic flaw: neither man could ever leave baseball well enough alone. For Peter Angelos is very well aware that he owns the Baltimore Orioles, and since he owns them, he's damn sure going to have a say in how they're run. What he either doesn't appreciate or has the monumental hubris to believe he can overcome is that at no point since he bought the Orioles has he stopped running his law firm. He's still up there on the 22nd floor of One Charles Center working ten- and twelve-hour days, focusing on—well, who knows? Pressing litigation, personal finances, philanthropic responsibilities? The depth of Angelos’ philanthropic commitment to Baltimore makes them a very real time concern. Even if one assumes the least generous reading of philanthropy, that the rich donor is doing it just for the tax write-off and contact high he gets from his status as a Superior Moral Being, Angelos still kept the city pools running with an anonymous gift one deathly hot summer, still routinely and discreetly pays his staff's critical medical expenses, still helped save and expand the city's largest soup kitchen and still offered to front the cash to keep the Preakness in Maryland, though that turned out not to be necessary. To this day, Angelos has more than enough to keep him busy on that front. The thing about running a baseball team is, if you're only paying attention half the time and the other guy is paying attention all the time, he's going to see things you miss. He's going to realize Albert Belle's not going to be worth that contract. He's not going to get sentimentally attached to Brian Roberts. And, if you hire someone to pay attention all the time, someone like a General Manager or, as Angelos insists on calling the position, an Executive Vice President of Baseball Operations, and he says one thing and you decide to do another because you know better—well, you deserve what you get. The proper response to a fist to the face like the Albert Belle signing is to learn how to get out of the way, not to start headbutting every set of knuckles in sight. Since he bought the club, Angelos has gone through seven top executives, not counting the most recent hire. With the exceptions of Pat Gillick and Frank Wren, who account for a combined four of Angelos' 18-year ownership the team, none of those executives have gone on to hold positions of importance in any front office in Major League Baseball. Syd Thrift, was born the same year as Angelos, took over for Gillick at age 70, ran the club for three years before retiring and passed away in 2006. Jim Beattie, who worked with Mike Flanagan from 2003-2005, is currently a scout with the Blue Jays. Jim Duquette, who also shared executive duties with Mike Flanagan from 2005-2007, currently hosts a talk show on XM Radio. The recently departed Andy MacPhail has designs on the Commissioner's Office once Bud Selig retires, and neither has time nor credibility to waste on the Orioles any longer. The record indicates that not only is Angelos a poor judge of executive talent, but he poorly distributes the position's responsibilities and is unable to retain executives who show a slip of capability. (Before retiring, Gillick helped put together the Phillies team that won the World Series in 2008, and Wren has had some meager success in Atlanta.) His record of dealing with baseball executives and operations has been so poor that he's rendered his franchise toxic. No top-flight candidate is about to leave a good situation to come to Baltimore this year, when next year they can go to the Astros' new ownership and obtain more power in a weaker division with a better support framework. Houston lost 106 games last year. Mike Flanagan is a special exception to the above. He remains one of the greatest Orioles pitchers of all time. He was also one of Baltimore's top executives from 2003-2007, one half of Angelos' often-derided Double-Headed GM, and writing about him is still surprisingly difficult even now. He was put in an impossible situation for which he was not suited and he performed poorly in it, but he was a funny, charming man whom no one could ever say a word against. Hearing him talk, no matter what about, made all the losing some slight bit more palatable. Not good, but palatable. By all accounts he never quite got over how poorly his time in charge of the team went. 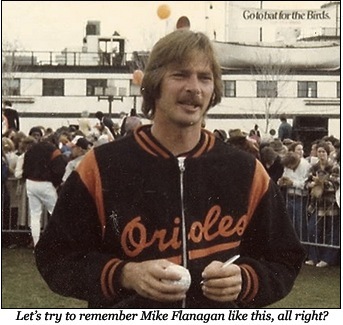 Flanagan took his own life on August 24 of this year. Apparently Dan Duquette gives a fantastic presentation. Following his initial interview, one member of Orioles' transition team tells Mid-Atlantic Sports Network's Roch Kubatko that "nobody is more connected to the Asian and Latin American markets than Duquette," which is prima facie ridiculous. As far as his resume is concerned—a resume publicly available on the professional networking site Linkedin.com and listing Ugueth Urbina as a positive achievement—Duquette's overseas involvement and experience is mostly concentrated in a failed Israeli baseball league. It is at best unclear how he could have appreciable pull in any international market, given that he has not worked in the major leagues or organized baseball in about a decade. Nevertheless, the Orioles are impressed. Or as Ken Rosenthal puts it, the Orioles are desperate for a new GM, and Dan Duquette is desperate to be GM again. He interviewed for the Angels opening that Dipoto ultimately got; perhaps that's what put him on the Orioles' radar. More likely is that Jim Duquette still has some connections in the warehouse; after all, Angelos has made sure a lot of the guys who worked with Jim remain there today. Whatever the reason, Duquette blows away the Orioles' committee. They decline to schedule any more interviews, and on November 6 the Orioles announce that they will name Dan Duquette their Executive Vice President of Baseball Operations. All that's left is the press conference. The press conference goes surprisingly well. Duquette says all the right things: that big-splash free agent signings like Prince Fielder are not a priority and that he does not see how they would help a team in Baltimore's situation; that the team needs to reinvest heavily into scouting, the farm system and the international free agent market; that pitching is a major organizational concern, and that acquiring pitching is a cornerstone objective of his front office moving forward. Despite being out of the game since before the invention of phones with cameras, Duquette sounds like he's accurately assessed the needs of the Baltimore organization going into the 2011 offseason. One would hope his presentation included all of that. But the knock on Duquette has never been that he's stupid, or that he can't evaluate talent, or that he's comfortable with mediocrity, or that he's a sycophant. It's the opposite, in fact; the knock on Duquette is that no one likes him. That he built half a World Series team for Boston and still wasn't able to find a job in the majors when they canned him doesn't exactly disprove the notion. Duquette addresses this in his introductory press conference, saying he'll be a "kinder, gentler" version of the executive the Red Sox fired, but the truth is that those organizations had problems outside of an ornery general manager. There were concerns that Duquette got too attached to his own guys and bought too much into his own acumen. The latter-day Duquette Boston teams were renowned for having big name trade and free agent guys but absolutely no depth, and when he was fired the Sox had featured some of the worst systems in baseball for two or three years running. It goes without saying that no executive can thrive in Baltimore by signing big ticket free agents alone, especially not in 2011. There is, of course, no open window into the warehouse. There's no way to tell how much of Duquette's vision will translate into reality and how much of it will run into the organizational inertia that has fettered the Baltimore front office for almost two decades. There is no way of knowing if this time really is different, if the new hire really will have free rein, if Peter Angelos has really been so shamed by the national reaction to the latest Orioles farce that he's now willing to let someone whose focused on nothing but baseball run his baseball team. And as an Orioles fan, there is no way of looking away from that beautiful flicker of possibility, caught as it is in some twisted quantum state where it only starts to fail the moment you start to hope. One thing's for sure: Dan Duquette has walked into the worst job in baseball with a smile. And why not? He literally has nowhere better to be. In 1994, Peter Angelos had owned a baseball team for all of 18 months or so when the infamous strike began. 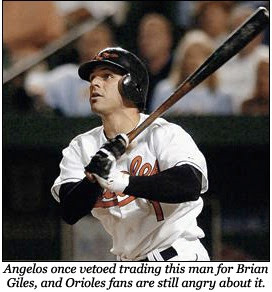 Hall of Fame Oriole shortstop Cal Ripken, Jr., gets a lot of credit for saving baseball that year; Angelos gets remarkably less. Nevertheless, Angelos was the only owner to break ranks and publicly support labor during that strike. A lot of people have forgotten this, partially because a lot of people in this country view unions only slightly better than they view street gangs, and partially because fifteen years is a lifetime in sports when you're losing. Angelos doesn't speak much publicly anymore; he has withdrawn inside himself. This is to be somewhat expected with old age, but by all accounts Angelos is as spry now as he's ever been. Angelos once gladly spoke to the media and boasted of the success and glory he'd bring to the city's baseball tradition. He does not grant interviews anymore. He refuses to disclose his personal financial commitments to the team, but sources close to the club claim he's dumped over $100 million of his own money into the team in loans that have not been and likely will not be repaid: good money ever after bad. But he's still a good negotiator; when he lost the battle to keep the Montreal Expos from relocating to Washington, he turned around and spearheaded MASN, which has paid out lucratively for both himself and the owners of the Nationals. He does these things out of self-interest, of course, but his self-interest includes the success of the club. That said, wanting is not winning. Angelos should sell the team. The health of the franchise demands it. Angelos is not some devil come up from Hell to ruin the Orioles like the McCourts have the Dodgers. That story is simple and easy: Frank and Jamie McCourt are scum with an executive checkbook. Angelos is a stubborn old prick who desperately wants his team to be good, and whether that's out of civic pride or gargantuan ego is speculative and irrelevant. He squandered his chance and likely his legacy along with it. Angelos spent 30 years fighting for the working man in Baltimore and as far as is possible in our society, he won. All Baltimore will remember him as now is the man who ruined their baseball team. And Duquette? 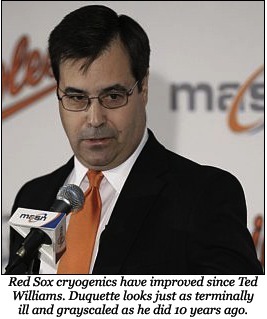 Best of luck to Dan Duquette. He'll need it. He has to turn around the worst organization in baseball while playing in its best division. His farm system is the first round picks of the last two years, shortstop Jonathan Schoop and an expanse of tumbleweeds baking in the sun. The money's there if he needs it, but if he uses it now it means it'll be useless later; if he uses it now, he has no idea what he's doing or what kind of team he's running. Duquette, though, is playing with house money. He's not like LaCava. He doesn't have a reputation to lose. His last job was running a sports camp for kids. If he fails, he returns to obscurity, just another good baseball man chewed up and spit out by an out-of-touch organization. No one would blame him for not being the guy who could turn the Orioles around. But if he succeeds, then the bitter, honorable failure of an owner's last desperate gamble for a pennant-winning team came to rest on the shoulders of an outcast who was kicked to the curb and stayed there for 10 years, achieved in the face of the league's two highest payrolls and its two best front offices. For better or worse, the most improbable underdog story in recent baseball history has just kicked off in Baltimore. Let's give it a bit more time before putting Moneyball on notice.